The Eagle is a proven combat fighter with a distinguished history. It is one of the smallest fighters available with jump capability. It has the distinction of being the only ship that has been so successful versions have been built for both the Federation and Imperial navies. This role has been superseded by the respective navies' short range fighter programmes, but the Eagle still sees extensive service across human space. Core Dynamics are no longer building these ships, but do still provide part and servicing due to their popularity. The Imperial Eagle was added in the v1.4 update CQC on October 6th, 2015. 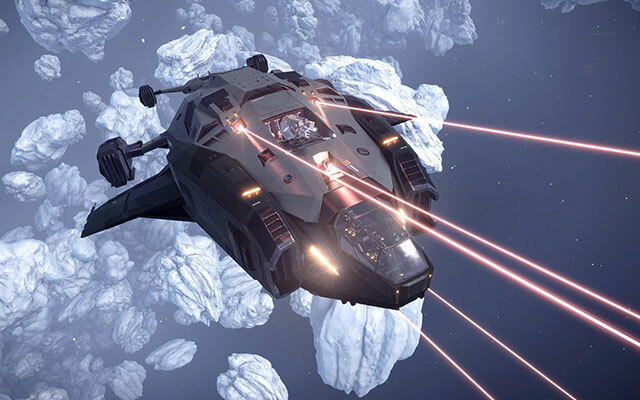 The concept art image was shown during Frontier's Q&A session at Lavecon 2015 and it is variant of the Eagle MkII; also known as Eagle MkIII. It is faster than the Eagle MkII at the cost of a lower manoeuvrability. It boasts superior armour and shield strength in addition to one medium Hardpoint replacing one of the three small on the regular Eagle MkII. It is the third fastest ship in the game, with only the Cobra MkIII and the Clipper being faster.